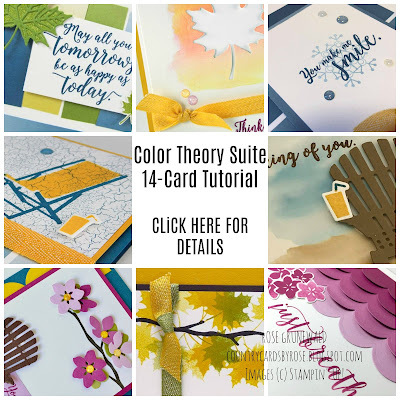 Country Cards by Rose: Color Theory Suite Winter Card & AMAZING July Promos! Color Theory Suite Winter Card & AMAZING July Promos! Wowee! Can you believe it's already July??? The summer sure is flying by! I hope you are having as much fun this summer as I am - it's been a blast spending time with friends and family on our family vacations. Have you heard people talking about Christmas in July??? Well, Stampin' Up! is celebrating Christmas in July right now! When you sign up to be a discount shopper in the month of July, you get a lot of amazing stuff, including the FREE Carols of Christmas stamp set!!! Check out everything you can get for free below. Don't want to wait for the tutorial to make one of these unique cards? Then follow along below to make a beautiful winter card using this Suite. Adhere blue stripe DSP to the thick whisper white card base with the darker colors positioned at the top. 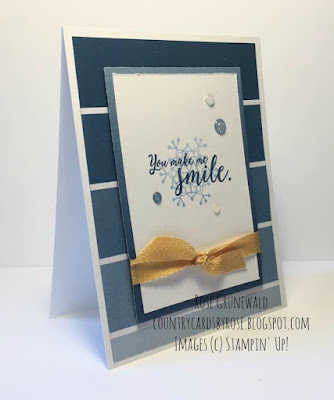 Stamp snowflake in Dapper Denim by first stamping off onto a scrap piece of paper and then onto the whisper white piece. Stamp “You Make Me Smile” sentiment over the stamped off snowflake. Adhere stamped whisper white layer to solid blue ombre DSP with lighter color positioned at the top. Tie Crushed Curry Ribbon around card front layer as shown and adhere to card front using dimensionals. Position glitter enamel dots as you like.